Max Weber has shaped the distinction between functioning and failed states. In his words ”a state is a human community that (successfully) claims a monopoly of the legitimate use of physical force within a given territory”. For Somalia the effective monopoly of power has not been with any form of state since 1991 as it has been topping the list of the failed states index for the past five consecutive years. The disastrous US intervention in Mogadishu in October 1993 lead to a shift in US foreign policy, towards non-intervention in Somalia. Unchecked by outside forces, the state further fragmented into several smaller regions that were dominated by war lords. As such it became a refuge for radical islamists and organised crime. It was only through the rise in piracy throughout the first decade of this century, and in particular due to a sharp increase in piracy attacks in 2008, that the world seemed to notice and care again about the situation in Somalia. The interest may be partly driven by the romantic ideas that Hollywood’s pirates inspire, but mostly, as we argue, because Somalian piracy has been an externality. But how costly can such an externality from statelessness be? What is the tax rate at with which Somalian piracy taxes world-trade? And how does this tax rate compare to an optimal tax rate? Our recent research aims to answer these questions, thus shedding light on the key questions about the role of institutions in securing trade from predation and theft (see e.g. Dixit (2004) ). Our window into obtaining estimates of the “piracy tax” comes from micro-data on individual shipping contracts. This approach is methodologically more powerful than indirect accounting approaches such as the various One Earth Future Foundation Reports (2010, 2011), which lack any counterfactual. 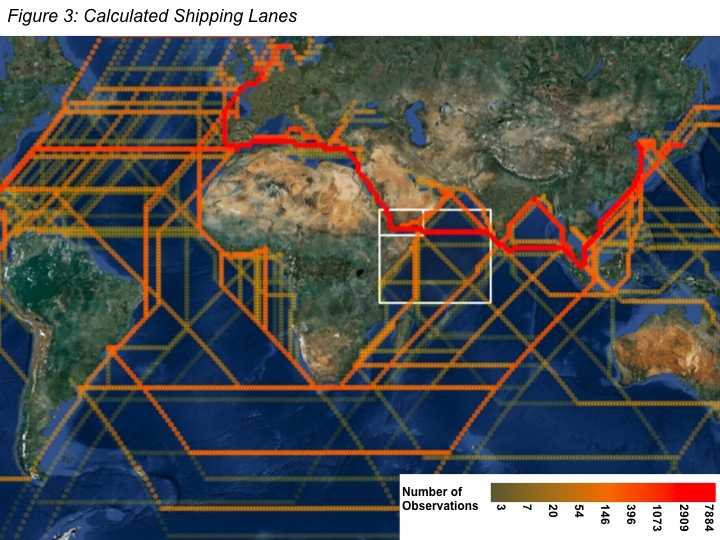 We consider the direct link between the risk of piracy attacks and the cost of shipping by studying the impact on chartering rates on maritime routes that vary by (1) whether and (2) the extent over time to which they are exposed to Somalian piracy. Most of the trade between Asia and Europe has to go through the Gulf of Aden and is thus, potentially affected by Somalian piracy. The fact that the Gulf of Aden is one of the business shipping routes becomes clear by inspection of our data on chartering contracts. Roughly 25% of our ships are travelling through the Gulf of Aden. This graphical representation highlights how important the Suez Canal is for world trade. Anything that disrupts trade through the Suez Canal has thus the potential of disturbing patterns of trade. The role of the Suez Canal and its impact on trade has been studied in a related study by Feyrer (2009), who looks at the Suez Canal closure as a natural experiment. 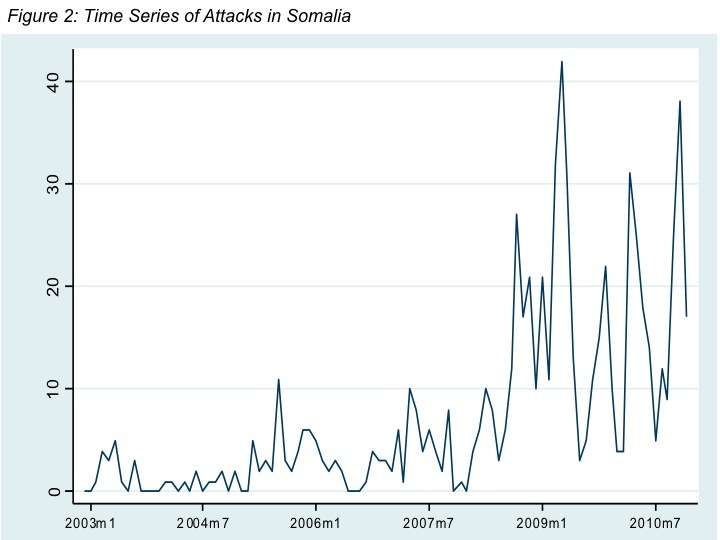 We argue that the upsurge in piracy in spring 2008, which becomes evident when studying the monthly time series of attacks, has been disrupting trade and has lead to several reactions by the shipping industry. The cost of these reactions are passed on to the charteres and eventually to the consumers of traded goods. The impact on shipping rates is our window through which we estimate the “piracy tax”. 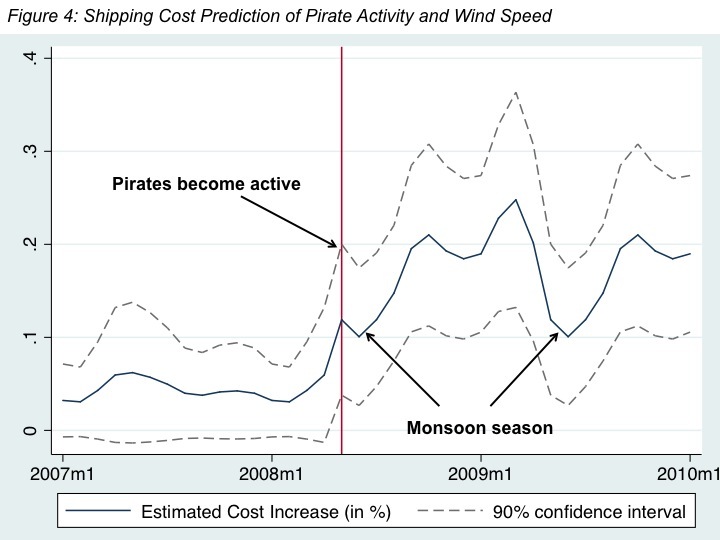 Bringing both of data-sets together, we find that piracy caused an increase in the transport cost by around 8%. We identify this increase in the cost both from the sudden increase in violence intensity in spring 2008, but also from seasonal variation in the intensity. In particular, early summer is a period of relative little piracy activity. We show that this is due to the Monsoon season, which just makes it difficult for pirates to operate in their small vessels. Hence, the estimated effect varies significantly with the season as the risks are lower. This is illustrated in the following picture. The piracy tax is lower in the Monsoon season. We check that this drop in shipping rates is not due to less shipping through the area. Taking our estimates seriously, the overall costs of Somalian piracy can be obtained by scaling up the point estimate by aggregate measures of trade through the region. Clearly, such estimates will have very large standard errors – however, their foundation is a solid micro-econometric estimate. Given this we find that, at the lowest level, the $120 million in net revenues that pirates generate are far offset by the costs borne by the shipping industry, which lie between $ 0.9 billion to $ 3.3 billion. One could compare the revenues generated by piracy to an equivalent tax rate on traffic through the Gulf of Aden or the broader Somalian territorial waters. If we follow this avenue, we estimate that the equivalent tax rate on traffic would be well below 1%. What does this mean? It highlights that a functioning state is able to implement redistributive policies a lot more efficiently than a “roving bandit” ( Olson, 2000). Hence, this exercises provides a sense of how much value is generated by installing functioning institutions and a functioning state. Is there a solution to Somalian piracy? As Somalian piracy is a classical externality, there is a need for cooperation to adress the problem. Many commentators argue that the only long lasting solution is to provide support on the ground in Somalia. However, international cooperation is difficult to muster, due to varying geo-political interests of the players involved. Besides we are not the only Power with large interests at stake. French, Americans, and Germans carry on an extensive trade [...] Why should we then incur singly the expense of suppressing piracy if each provided a couple of gunboats the force would suffice for the safety foreign shipping which is all that devolves upon [..] why should the English tax payer alone bear the expense? This sentiment highlight the public good aspect of travels on global water ways. This research will fall short of providing policy suggestions, however, it highlights that piracy is most likely one of the costliest ways of making transfers to Somalia.